Have you ever tried Gazpacho? 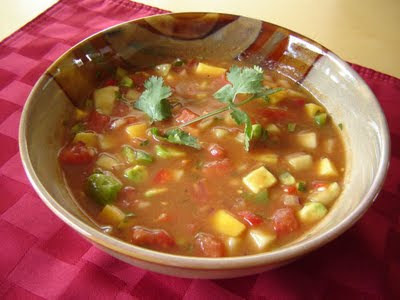 It's a Spanish tomato-based raw vegetable soup that you serve cold, best served during summer months due to its cool refreshing qualities. It's one of those things that I've made in the past, and whenever I have it, I think "Why don't I make this more often?" To be honest, I haven't made it in years, and I don't have any certain go-to recipe for it. Well, that is, until NOW! My friend Kathleen was thoughtful enough to pass this along to me. I hope you'll give it a try! Thanx Kath!!! OMG!! Joey!!! I had the VERY BEST gazpacho EVER today!! A girlfriend of mine took us and the kids out on her boat today and she shared this with us. It was HEAVENLY on this hot, summer day!!! If you like gazpacho, you have to try it!!! Serve with bagel chips or corn bread croutons. So good on a hot day- you need nothing else!